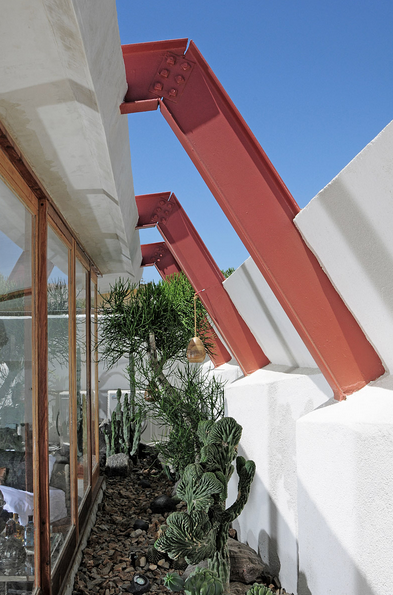 One of the biggest draws to the Palm Springs area was to see my friend and designer Tracy Beckmann who along with her business partner Ryan Trowbridge created a Mid-Century Modern masterpiece, Hotel Lautner. Tracy and I met about six years ago and became fast friends, and while we don’t get to see each other often I continue to be inspired by her and her creations. We met for a drink to reconnect and the night ended with me running to my hotel throwing all of my things in my car and racing to Hotel Lautner to stay the night. 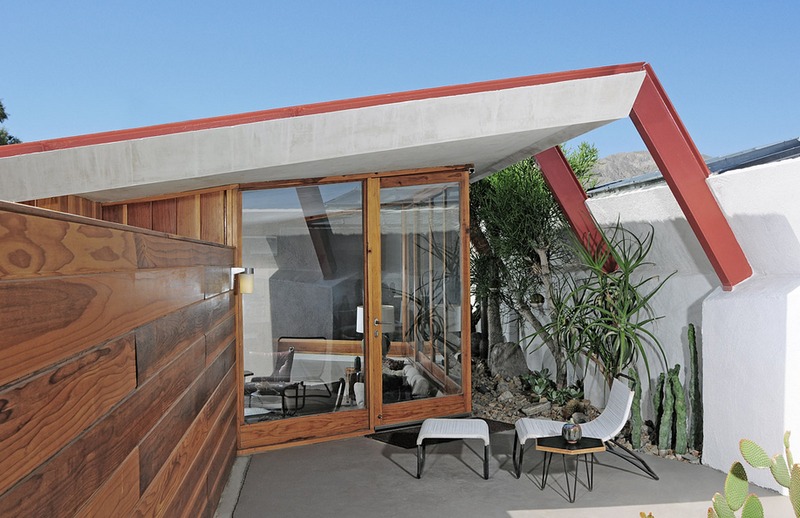 Hotel Lautner came to life when Tracy and Ryan found the old Desert Hot Springs Hotel, designed by the famous modernist architect John Lautner. You can see before and after pictures of the amazing transformation here. 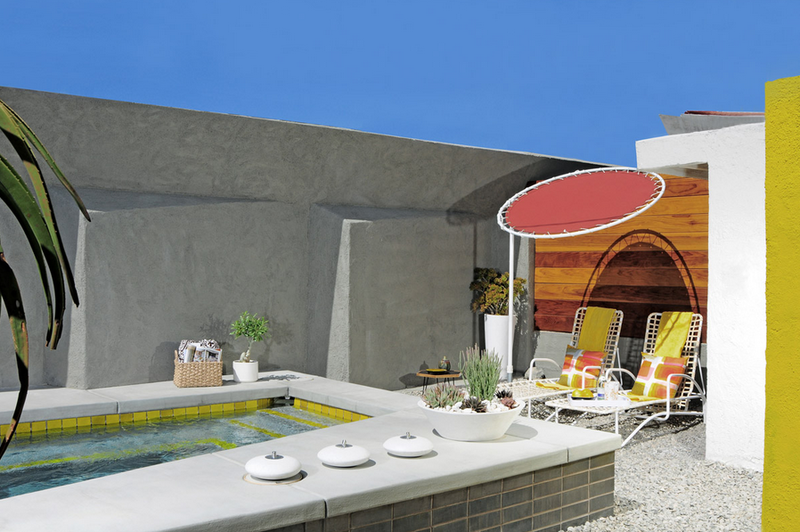 I have watched from afar (aka Facebook) while the Hotel Lautner has been recognized for its design by magazines such as Conde Nast Traveler, Travel + Leisure, Architectural Digest, Dwell and so many more. I was ecstatic to spend the night in The Redwood Lounge, sleeping on the luxurious Frette linens, listening to Frank Sinatra records and soaking up the ambiance which in my opinion has been done perfectly. Tracy thought of everything when creating her luxurious suites, from flattering shower lighting to dark washcloths for makeup removal to eye masks to keep out the light shining through the wall of windows. There was only one bad part of my experience and that was when I had to lock the door behind me and say goodbye. Not only is Tracy a wonderful friend and great designer, she also keeps great company. I had the opportunity to meet her talented artist boyfriend Danny Heller whose photorealism paintings capture Mid-Century Modern architecture, he has captured many LA and Palm Springs scenes and has recently been asked to show in and about New York. If you find yourself in New York you should stop by the George Billis Gallery for his opening reception on September 4th, 2014. 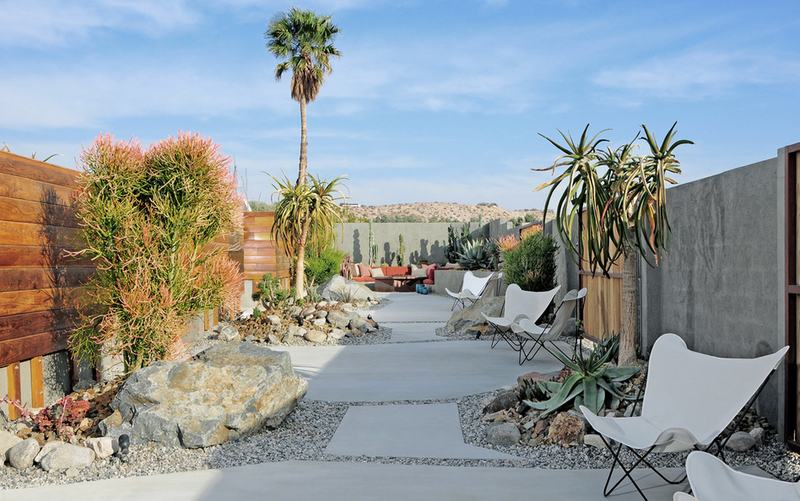 I can’t wait for the opportunity to experience Hotel Lautner again and I highly recommend taking the road less traveled out of Palm Springs and heading to Desert Hot Springs for a weekend retreat in this desert oasis. 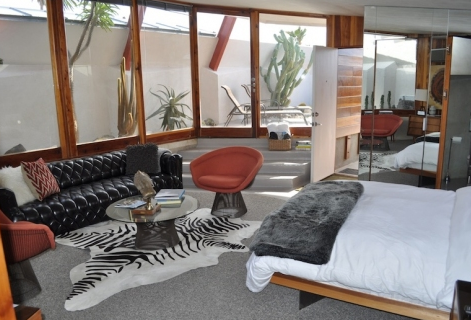 All images below were taken from www.hotellautner.com. 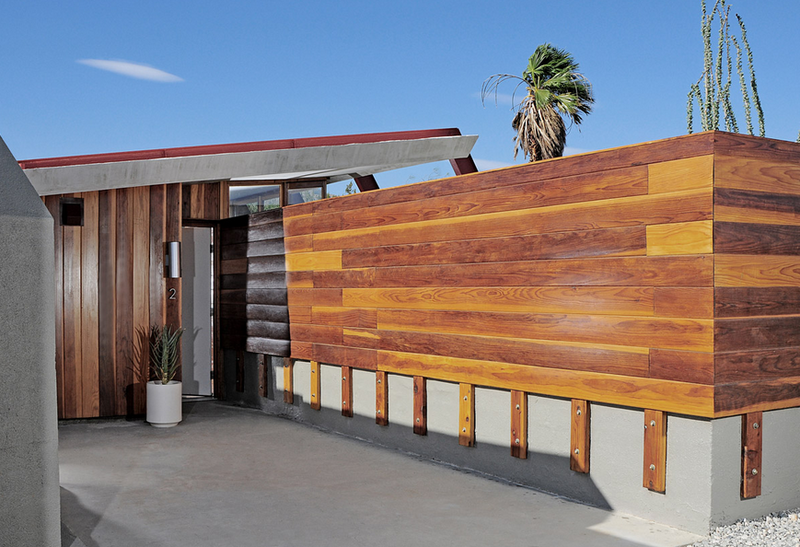 Having an interest in design, particularly mid-century modern design had me excited to visit Palm Springs. It has long been on my list of places to visit and this trip gave me the opportunity to fulfill this wish. I spent the day driving around hopping from one boutique to another but it wasn’t until I entered Hedge that I fell in love with the town. I came upon the store on accident having followed my gps directions to a thrift store that refused to be found. Upon entering the store I was quickly greeted by the owners, Charles Pearson and Thomas Sharkey and offered an espresso. I knew I wasn’t able to actually purchase anything in the store due to budget and cargo space so I declined, it seemed rude to accept such a treat when only window shopping. I began chatting with Thomas as he was making his own coffee and I quickly knew I was in this store for a reason. We began talking about my journey, his upcoming birthday travel plans and both of our pasts working in private family services. We chatted for a bit before he invited me to sit with him where he shared their path to owning their store and where I found great inspiration. Both Charles and Thomas encouraged me to search for my passion, to create my own future. I walked out of that store a few inches taller, happy to have met some new friends and in love with a town that supports such amazing independent businesses. Thomas later wrote to me in an e-mail “You are making known the unknown and …… you are doing what most people are afraid to do and never will do.” Regardless of where my upcoming path takes me I am thankful for moments like this where I meet truly amazing people who make me a more confident person, inspire me to live an authentic life and who take the time to chat with a wind blown stranger on what has proven to be an epic journey. 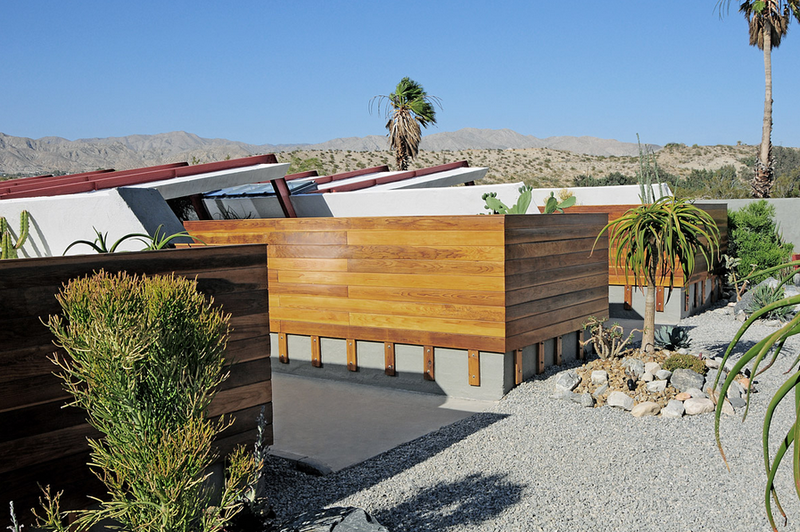 I highly encourage you to add Hedge to your “must visit” list when you next find yourselves in Palm Springs, and don’t make the same mistake I made, accept when they offer to make you an espresso.